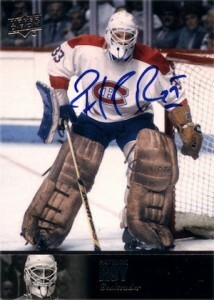 When talking about the greatest autograph sets in the history of collecting, most in the hobby have a few favorites. 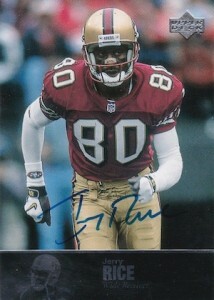 One set that has emerged as a frontrunner is the main autograph set in 1997 Upper Deck Legends Football. Well ahead of the curve, the set basically amounted to a partial autographed base parallel. 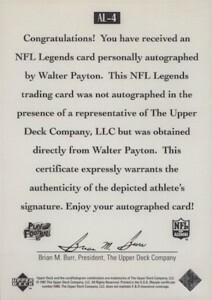 As the name indicates, the Upper Deck Legends product covered some of the biggest former greats in football history and the checklist is filled with plenty of Hall of Fame talent. The timeless design is both simple and refined. Beautiful player images compose 80% of the card, with a small shaded text box featuring a black-and-white image and the player's name and position at the bottom. All autographs are signed on-card. Further adding to the appeal of the product, the cards were pulled around one in five packs, or four per hobby box. Despite this frequency, collectors soon realized that multiple cards were considerably more rare than others. As time has passed, 18 cards have been identified as short prints (SP). Most of the SPs fall in the beginning of the checklist. Also, the cards for five players were inserted into packs as redemptions, but they never returned their signed cards to Upper Deck. 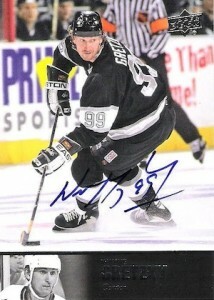 Therefore, these autographed cards were never officially issued by Upper Deck. The SPs and redemption cards are noted on the checklist found on the next tab. Like most things in the hobby, popularity normally leads to increased monetary value, which unfortunately can result in counterfeits. Because the autographed cards were essentially signed base cards, it was far too easy to have them signed in-person or simply forged. With dealing with the more valuable cards, especially the short prints, the safest route is to buy professionally graded cards to ensure authenticity. That does not mean that raw cards are not worthwhile, just make sure you do your homework. The most obvious difference is the card back, which can be seen above. The autographs also feature a specific prefix (AL-) which helps distinguish them from the base numbering. For those that prefer the thrill of the hunt, sealed boxes are in much shorter supply and quite expensive, but it is not impossible to track them down. View current 1997 UD Legends Football boxes on eBay here. Buoyed by the success of Upper Deck Legends Autographs and other signed sets, autographed cards would become the driving force of the collecting industry. Nearly a decade after their release, Upper Deck included an update using the same design and continuing the numbering from the original run. The cards were found in 2008 Ultimate Collection Football and included some of the bigger current names from the time when the original set was released. Because it centered on legends, star players at the time, like Jerry Rice and Barry Sanders, were not included in 1997. This was remedied in 2008 and again in 2009 Ultimate Collection Football. In both releases, the cards were found about one per case. Although Upper Deck lost their football license soon after, they brought the design back in 2011 Upper Deck College Legends. The updated insert features the same design but includes college images and uniforms. Just like in 1997, there are un-signed base versions. 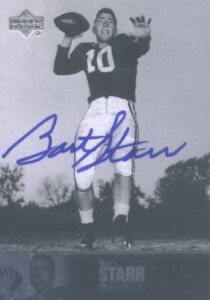 The Legends autographs continues in football with a college theme in 2013 Ultimate Collection Football. Not just limited to football, the design was also revived for inclusion in hockey and basketball. The hockey edition is NHL-licensed, and is found in 2011-12 Ultimate Collection Hockey, 2012-13 The Cup and 2013-14 Ultimate Collection. The basketball version is college-themed. Instead of following the original design, the 2010-11 Ultimate Collection Basketball version uses an image of a basketball in place of the small player image that was previously found at the bottom of the card. 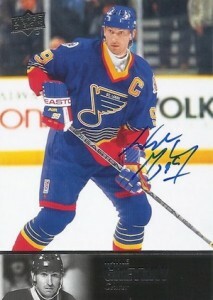 Full checklists for all the Upper Deck Legends sets can be found above using the corresponding tabs. Also, we have included a real-time list of the top-watched UD Legends on eBay on the last tab. Short prints (SP) are noted below. Cards with an asterisk (*) were available as redemptions, but were never issued because signed cards were not returned to Upper Deck. Autograph parallels are found 1:5 packs, or four per hobby box, on average. Short prints (SP) are noted below. These autographed inserts are found one per case, on average. These autographed inserts are found one per case, on average. Also, there are printing plate parallels (cyan, black, magenta, yellow), numbered 1/1. The short print (SP) information is much more detailed in 2011 UD College Football Legends and the numbering starts over. The full breakdown by grouping can be seen below. The next 40 cards were found as an insert in 2013 Ultimate Collection Football. Short print info can be seen below and redemptions are marked with an asterisk (*). CHARLIE JOINER 1997 UPPER DECK LEGENDS AUTOGRAPH AUTO -CHARGERS!! CHUCK MUNCIE 1997 UPPER DECK LEGENDS AUTOGRAPH AUTO -SAINTS!! STEVE BARTKOWSKI 1997 UPPER DECK LEGENDS AUTOGRAPH AUTO -FALCONS!! JACKIE SMITH 1997 UPPER DECK LEGENDS AUTOGRAPH AUTO -CARDINALS!! KARL MECKLENBURG 1997 UPPER DECK LEGENDS AUTOGRAPH AUTO -BRONCOS!! These autographed inserts are found one per case, on average. A detailed breakdown of each autograph grouping can be found below. Although they are technically part of the Ultimate product line, the 2012-13 Legends Autographs are found in bonus packs from 2012-13 The Cup Hockey. A detailed breakdown of each autograph grouping can be found below. The insert line continues in 2013-14 Ultimate Collection and the numbering overlaps slightly with the 2012-13 set. Full short print info can be seen below. These autographed inserts are found one per case, on average. While most of the autographs feature blue ink, it appears that Jerry West signed some cards using gold and silver ink and David Robinson signed some using gold ink. GEORGE GERVIN 2010 UD ULTIMATE LEGENDS AUTO AUTOGRAPH CARD! 2010 UPPER DECK GREATS OF THE GAME LEGENDS OF THE HALL WALT FRAZIER AUTO 2 5!! The list below provides a real-time look at the 20 most-watched Upper Deck Legends Autograph cards currently available on eBay. The list is constantly updating to give collectors the most accurate picture of the most popular cards on eBay. I remember these with great fondness! I was buying blister packs at Walmart after work. 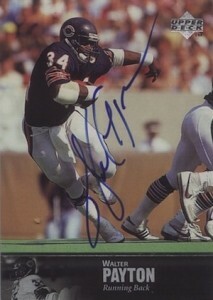 Pulling the Ditka Auto one day was my best hit. Great article, I have been collecting autos but only the al with the back cert from Upper Deck.